Chris’s teaching combines Theravada Buddhism’s emphasis on insight and ethics with the Mahayana ideal of compassionate action, along with the synthesis of practice and study. He is particularly interested in exploring the roles of transparency and vulnerability in teaching the dharma effectively, and in how principles of integrity and kindness form the basis of caring communities. He is also influenced by the fields of ecopsychology, attachment theory, and contemplative, pastoral, and palliative approaches to sickness, aging, and end-of-life care. Prior to focusing on Buddhist practices Chris taught Hatha yoga, directing a community yoga center in Gloucester, MA, and training yoga teachers internationally at the 200-hour and 500-hour levels. 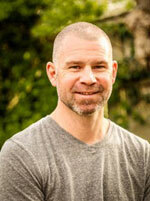 Chris’s yoga combines yin, viniyoga, and kripalu, with trauma-sensitive methodologies and mindfulness. This approach combines slow vinyasa forms with long static holds, balancing physical strength and meditative awareness. His weekend-format yoga teacher training, Hatha-Dharma, developed to help students practice and teach a more awareness-based yoga, has been offered at yoga centers internationally. Chris has taught at Kripalu Center for Yoga and Health’s Institute for Integrated Leadership, the Trauma Center in Brookline, MA, and was active in yoga research with Kripalu Center’s Institute for Extraordinary Living and Brigham and Women’s Hospital. For Inward Bound Mindfulness Education (iBme) he taught retreats and managed the development of iBme’s Mindfulness Teacher Training program. His course Living the Good Life: Practicing Health & Wellbeing was for many years a core course in Wellness & Alternative Medicine at Johnson State College, and for several years Chris was a Hospice caregiver through Hospice of the North Shore & Greater Boston and Care Dimensions. As a visiting lecturer Chris has taught at Endicott College’s nursing program and Tufts University. He holds a Masters degree in Ecopsychology, Sustainable Leadership, and Buddhist Practice.